That’s the conclusion we came to when we asked our practitioners the question we get asked most often: how do I know how to get the best training in agile project management? At GDS we encourage the use of agile project delivery techniques for service delivery through the service design manual, so we are often asked for our opinion on the best ways to learn to become more agile. I gathered a group of agile practitioners into a room, this included delivery managers, agile coaches, transformation managers and agile team members. The scores ranged from 2 – 6 with number of years from 1 to more than 10, so we had a good spread of experience. 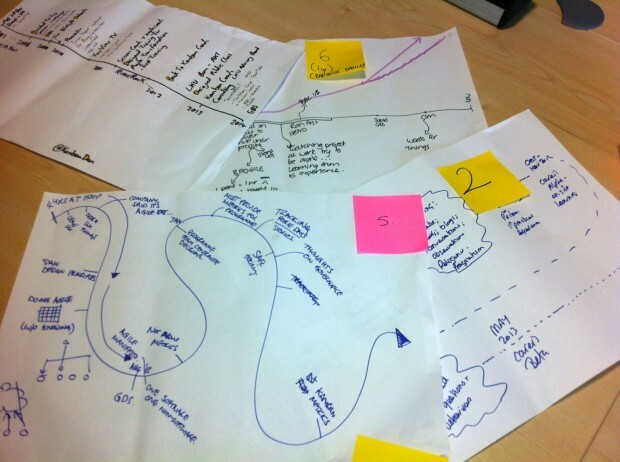 I then asked the people in the room to create a timeline, that showed the moment they first heard about agile to today. This included points along the way like: seeing agile done in organisations, formal training and starting to take part in agile projects. They then paired with another person in the room to discuss the good points and bad points along that journey. They wrote these up on post-it notes and shared with the entire group. The overwhelming message of the workshop that everyone in the room gave isthat they only got to this point through hands on experience. We have taken the outputs of this workshop and fed them into our guidance for agile training, which is now on the service design manual. We’d love your feedback in the comments below or contact me on twitter @ewebber.